Congolese music has certainly been the most influential of all the 20th century popular styles to develop in Africa; its influences on rhythms, on guitar styles, on vocal sounds and harmonies, coming back in unmistakeable echoes in recordings from every corner of the continent. In its most distinctive forms it has synthesised indigenous Central African elements with imported Cuban ones (which, of course, are African in origin anyway). The huge international success in the last 20 years of major figures like the late Franco, or Papa Wemba, or Tabu Ley (Seigneur Rochereau) represents the most visible aspects of this phenomenon, but behind all that there must be many, many bands not known outside their native country, and no doubt many hundreds more unknown outside of their home area. Along with the CD, there’s a bonus disc with a video clip (in various formats), and even more than the music on the CD, this short clip of the band in action, speaks volumes on how deeply rooted the band is in the local community. There’s a few pop-video style sequences, with acting and posing, and the occasional lapse into slow motion, but mostly, it’s just the band playing, against the background of village houses and trees, with the audience enjoying the music, dancing and showing their appreciation. A note in the booklet tells us how they frequently play at local fetes, electoral campaigns and cultural events, and it’s this sense of rootedness that comes across on the video clip, as well as in the music generally. More importantly, the video also gives us an opportunity to see the band in action. There are 8 band members on the CD (although there seem to be 10-15 associated with the band, including some described as 'organisers') but the sound is quite spare and concentrated. The melodic core is based on two electric guitars - Master Makape and Lutumba - and the rest of the band consists of percussionists Bamikina, Aziza, Kijos, Zimbotele Thomas, Papy Mbala and Muamba covering various traditional drums and bells, or adding additional harmony vocals. On the video clip we can see these traditional percussion instruments, including the characteristic Congolese likembe, and a thumb piano (which doesn’t seem to be amplified). It’s an entirely engaging sound, the guitars lifting the solo or harmony vocals along on a repetitive, cyclical melody, with call-and-response choruses interspersed at appropriate points. At its best, this can create a hypnotic, even euphoric effect over the length of an 7 or 8-minute track, that is quite irresistible. 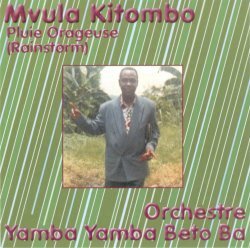 This release (Mvula Kintombo translates into French as Pluie Orageuse or, in English, Rainstorm) appears to be something of a departure for DJC records, a label run by Dave Clague, a former member of the Bonzo Dog Band, most of whose releases seem to feature UK artists, and of the names I recognised (like Kevin Coyne and Roger Ruskin Spear), many harking back to the alternative music scene of the1960s. All of which is good reason to celebrate the existence of small labels. Orchestre Yamba Yamba Beto Ba have made 8 previous albums, which I suspect have not enjoyed very wide circulation outside Central Africa - although one was apparently issued in France - which makes this UK release that much more welcome.